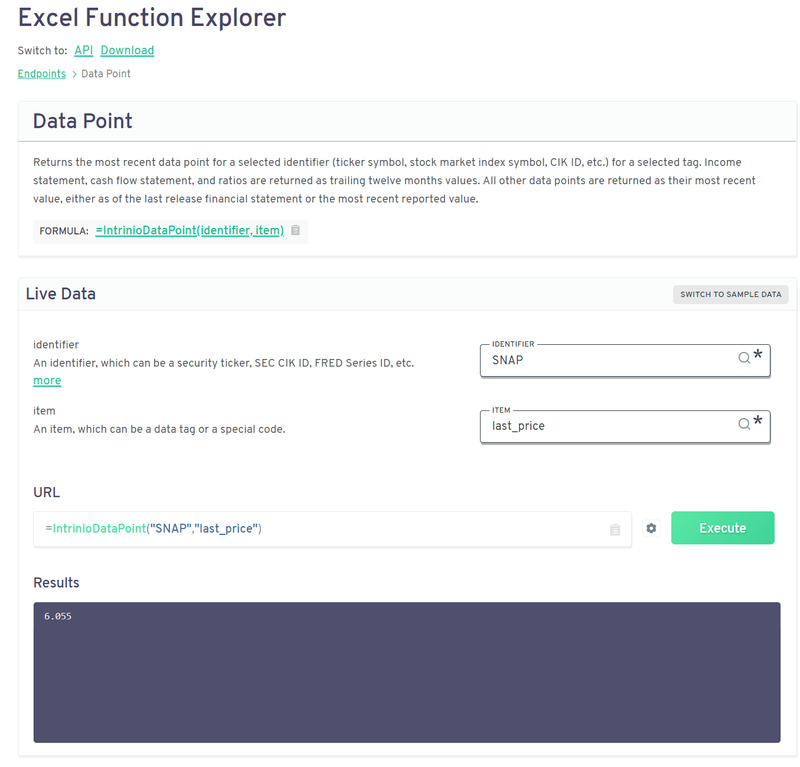 The API explorer will literally build your API calls, Excel Formulas and CSV downloads for you. Use it to create and test your syntax. What is the API Explorer? Intrinio sells many kinds of data: stock prices, analyst estimates, economic data- the list is extensive. This is great because "a la cart" data is much more affordable than all you can eat plans, but it can be overwhelming to sift through all of the data types. How can you find out which data types are available or how to sample those data types to see if they fit your needs? The API Explorer makes it easier for users to "explore" the data that Intrinio provides. 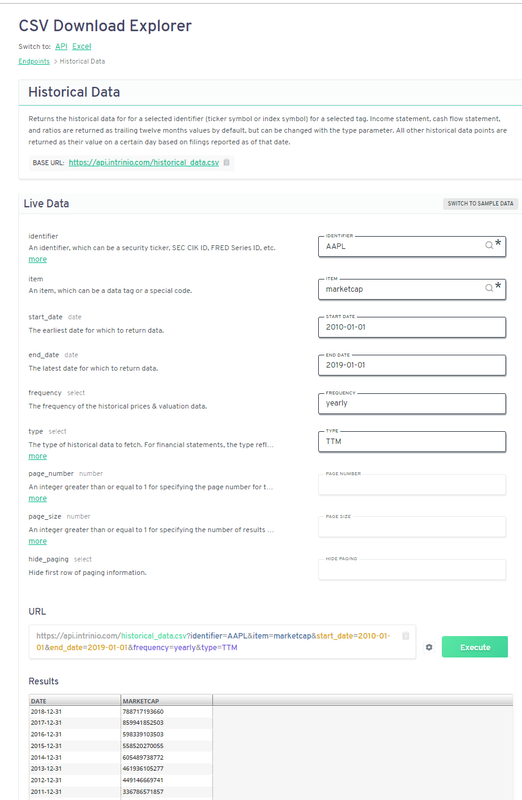 You can select a data type, like "prices" or "news", an access method, such as "Excel" or "API", and then the data you want to see appears with the click of a button. One way users take advantage of this tool is to see if the data they are looking for is right for them - in other words, to sample the data. The API explorer outputs this syntax for you so you don't have to. The point is to make it easier to explore the data so you know if the data feed you are interested in is right for you, and also to make it easier to access that data by building the syntax for you. How do you use the API Explorer? There are different links for Excel, CSV Download, and the API. Simply select the link that represents the access method you prefer. Analysts usually work in Excel and developers usually work with the API. When using the API Explorer, you simply click on the parameters to change them to include the data you'd like. The "Parameters" inputs allow you to search for the security you want to pull data for. Just click "Identifier" to search Intrinio's coverage for the stock you want. To change the data you get for that security just click "Item". If you want to get the latest price for Snapchat, you can search for "Snap" and "price", select the parameters you want, and then hit "execute". In the results area, you can see the JSON response and you can copy the HTTP request URL if you are an API user. If you change to the Excel link, you see the results as they would appear in Excel and can copy the Excel formula by clicking the clipboard icon. With CSV downloads, you can download results to your computer. The "Download" tab on the API explorer makes this functionality easy to use. 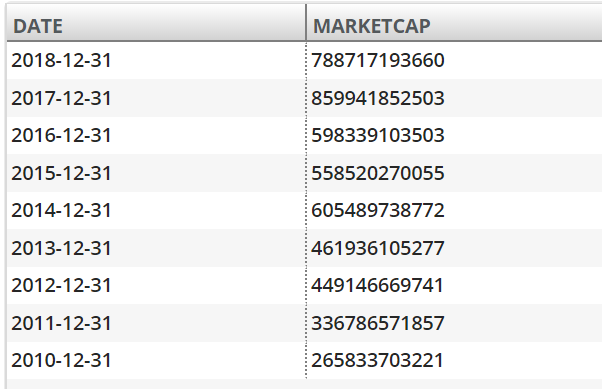 In the example above, you can request to pull Apple's historical marketcap from 01/01/2010 to 01/01/2019 with a yearly frequency. Using these very simple steps, you can explore all of Intrinio's data and, for users of Intrinio's other access methods, get the correct syntax to pull data into my analyses. The API Explorer breaks complicated syntax into simple steps, taking the confusion out of accessing Intrinio data. Why did Intrinio Create the API Explorer? Independent investors didn't really exist 20 years ago. Independent fintech developers didn't exist until recently. In both cases, financial data was too expensive for anyone without very deep pockets. Intrinio's mission is to change that, making financial data affordable and accessible. We know we are succeeding at the affordable part because each day we see dozens of indie developers signing up for our platform and creating apps for indie investors. Affordable data is still hard to use unless it's accessible, and one barrier to access is learning the syntax required to get the data in the right format. Our support team has helped thousands of developers figure out how to make API calls and thousands more Excel users figure out how to pull data into Excel. The API Explorer was built to make life easier for those users. By clicking the clipboard icon in the Data Explorer, users can copy the syntax they need and paste it right into their code or spreadsheets. Instead of sifting through documentation, those users have a tool that transforms their ideas into data. That makes Intrinio's data more accessible, meaning more people can become independent investors. And that is why Intrinio exists.